That’s the kind of aphorism costumers like to bandy about. What we don’t talk about very often is its corollary: you can only sell what you put some effort in to. I was reminded of this when I took a Middle Eastern dance workshop with a very nice young woman from San Francisco about a month ago now. As many instructors do now, especially when they come all the way up to our little corner of the world, she had brought along some items to sell, including some accent skirts made by another dancer of her acquaintance. These were essentially two rectangles of stretchy fabric with enough space left at the top that you could step into them and pull them up over your hips at the hipbone level. That’s it. That’s all they were. No hemming, no elastic at the top edge, no embellishment of any kind–just two rough cut, partially sewn rectangles. In my over twenty years as a Middle Eastern dancer, I don’t think I’ve ever seen a more slap-dash, thrown-together costume item. Yep, that’s all there is. 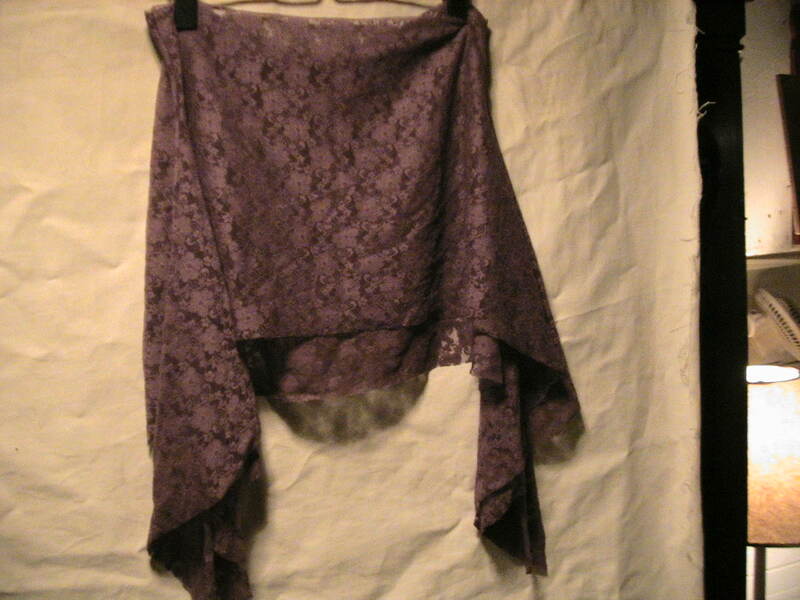 Two rectangles of stretchy fabric tacked together. Posted from Tribe.net. 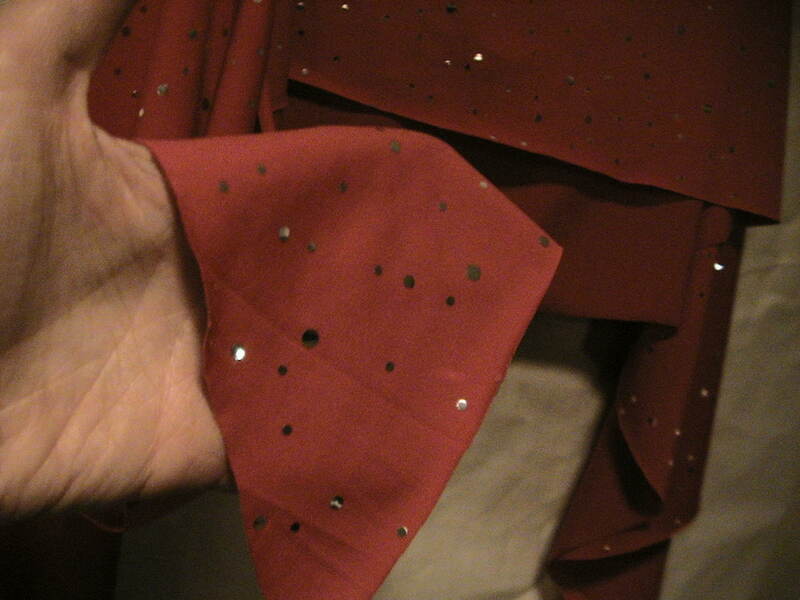 A close up of the accent skirt showing the raw, unhemmed edges. Posted from Tribe.net. When the class saw these accents skirts (which retail for $25-30), the common thought, voiced by many, was “I can make that”. These whispers must have reached the instructor because at the end of class she gave us a little speech about how hard it was to make a living as a professional dancer, how most dancers have to sell a little merchandise on the side to make ends meet, how she could totally understand if we wanted to make our own accent skirt because we had no money to buy one, but please, oh, please, if we do that to at least give credit to the designer [my phrase, not hers] and point people to the designer’s web site and PLEEEEASE don’t make our own copies and sell them and compete with the designer. To be fair, the accent skirt didn’t look bad once you had it on. Model is dancer Horizon. Posted from Tribe.net. That little speech really burned me up and I’m not sure what made me the most angry: the whining about a dancer’s lot, the suggestion that we were somehow bad people for not wanting to shell out for poorly made accent skirts, or the unmitigated gall in essentially claiming copyright for a costume item that lacked both originality and workmanship. Let’s set the record straight. For starters, the life of a performing artist has always been hard. That’s as true now as it was thirty years ago or three hundred years ago. You’re on the road a lot. You’re performing and bunking in a lot of so-so accomodations. You always have to be a business woman as well as an artist. That means doing a lot of other things besides dancing e.g. teaching, hosting your own TV program, writing articles, giving speeches, making videos (and now DVDs), maintaining a website, selling things (your own items or other people’s), and so on. You spend a HUGE amount of time working on your craft and very little time by comparison actually performing. And the bottom line is that no matter how much money you take in, you’re lucky to break even, let alone get back what you’ve laid out over the years becoming and maintaining yourself as a professional dancer. Being an artist always comes with a price and that’s ours. To lay any sort of exclusive claim to a costume design, legally or otherwise, the key word is “originality”. You have to demonstrate that your design is actually something that you have significantly altered or reworked to make your own, not just a riff on the square accent skirt that has been kicking around among dancers since at least the late ’70s. From a business standpoint, the more work it takes to make the costume item in question and the more complex it is, the more likely people are to want to buy it rather than attempting to make it themselves and the less likely you are to be plagued by imitators. There are always what I call “convenience shoppers”–people who will buy simple costume items because either they don’t want to take the time to make the items themselves or because the items are right in front of them. But if you as a costumer go the cheap, sloppy, and simple route, you can’t act surprised when people make copies for themselves or jump on the convenience store bandwagon with you. Buy a clue. Wow, it wasn’t like someone was trying to rip off Melodias or those Petite Jamilla pants. Unfortunately the bellydance scene is full of sheepish groupie mentality that will promote those kind of scenarios….